QINGDAO, June 9 (Xinhua) -- The presidents of China, Russia and Mongolia pledged to strengthen trilateral cooperation during their meeting here on Saturday. The trilateral meeting, the fourth of its kind, was chaired by Chinese President Xi Jinping and attended by Russian President Vladimir Putin and Mongolian President Khaltmaa Battulga. They reviewed the achievements of trilateral cooperation and discussed priority tasks and directions for the next phase. Since the heads of state of China, Russia and Mongolia held their first meeting more than three years ago, the three countries have centered on aligning China's Belt and Road Initiative with Russia's development strategies, especially its transcontinental rail plan, and Mongolia's "development path" initiative, deepened cooperation and yielded results, said Xi. The three countries are neighbors and traditional strategic partners to each other, and enjoy natural advantages and a good foundation for cooperation, he said. For the next phase, the three sides should deepen political mutual trust and strategic coordination, enhance mutual support, respect the core interests of each other, take into consideration each other's major concerns, strengthen coordination and cooperation in regional and international affairs, and steer the course of trilateral cooperation politically, Xi stressed. 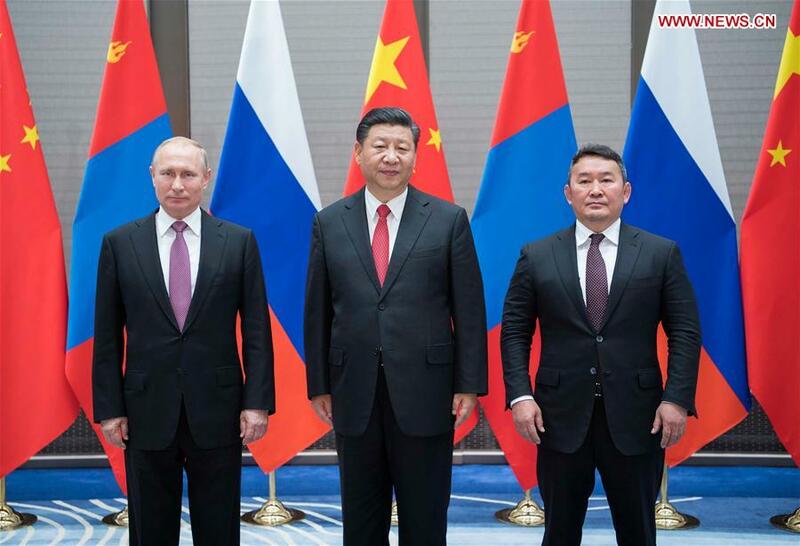 The Chinese president said the three countries should push the construction of the China-Mongolia-Russia economic corridor, actively explore cooperation in areas such as infrastructure interconnectivity, and promote sub-regional cooperation in adjacent areas of the three countries. The cooperation and coordination within the framework of the SCO should be expanded, said Xi. The level of Mongolia's ties with the SCO should be lifted and Mongolia is welcome to participate in SCO cooperation in a more in-depth way, said Xi. Russia agreed to strengthen trilateral cooperation in transport, infrastructure, customs and tourism, and facilitate trade and personnel exchanges, said Putin. Battulga said that it is Mongolia's top priority to develop friendly cooperation with the two permanent neighbors of China and Russia. Putin and Battulga are in Qingdao for the 18th Shanghai Cooperation Organization summit.